Vish Puri is a private detective living in Delhi. On the way to a cricket match where Vish's nephew, Rumpi, is playing in one of the opening matches of a new tournament, Vish stops by the home of Satya Pal Phalla. 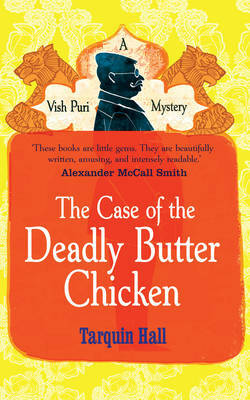 He has been called to investigate a most unusual theft, that of Satya's famous moustache - the longest in India. He takes on the case, sure that it will be one of Satya's rivals to the title that is the culprit. Later at the celebratory family dinner, Vish is delighted to find Butter Chicken on the menu and intends to tuck in to one of his favourite meals. However, the father of his nephew's rival, Kamran Khan, also enjoys the chicken and drops dead at the banquet. Vish is warned off the case by the inept Chief of Police who is star struck by all the celebrities at the banquet. Then Vish is hired to investigate the murder privately on behalf of a group trying to remove the stigma of illegal betting from the game of cricket. He will need all the skills of his highly talented team of operatives as well as courage as his investigation takes him into the dangerous world of illegal gambling and money laundering and even into Pakistan. However, another private investigation is underway: Vish's mother has her own theories as to why Kamran Khan was killed. She also journeys back to her homeland in Pakistan in search of confirmation of what she believes. Vish juggles the two cases with all his usual skill, although the case of the stolen moustache turns out to be more complicated that he originally thought and he begins to think he might even have met his match. Vish has been told by his doctor that he must lose weight or his health will suffer. His wife is on the case and insists on serving him healthy breakfasts and watching everything he eats. So an ongoing strand in the story is poor Vish's attempts to lose weight while still enjoying the food, and lots of it, that he loves, while pulling the wool over his wife's eyes. One of the many things I enjoy about these books is that all the characters, even the very minor ones, are drawn with such loving detail. The author reminds me very much of P G Wodehouse in his ability to poke gentle fun at people's foibles in such a way that we can recognise ourselves in them and end up laughing at ourselves as well as with the characters. This is the third outing of Vish Puri; a wonderful find. Very funny.